Counting down to the ski season, still off-season Whistler, in British Columbia, Canada, was an ideal place for student to concentrate on the study for the 9th International Accelerator School for Linear Colliders. This school was organised by the Linear Collider Collaboration and the ICFA Beam Dynamics Panel, and hosted by Canadian national laboratory TRIUMF. It is a continuation of the series of schools that began in Hayama, Japan, in 2006. Three continents take turns in providing the venue and close to 500 students have been trained in Erice, Italy in 2007, Oak Brook, United States in 2008, Beijing, China in 2009, Villars-sur-Ollon, Switzerland in 2010, Pacific Grove, United States in 2011, Indore, India in 2012 and Antalya, Turkey in 2013. The school was offered to graduate students, postdoctoral fellows and junior researchers from around the world, and the organising committee received much more applications than they were able to take, so they made a selection to invite the best students. “The goal of this school is try to prepare the ‘young army’ to build and operate this machine of the future because ILC is a big global project for the 21st century,” said Weiren Chou of Fermilab, one of the organising committee members. “You say “the old soldiers never die”, but they will fade away. So before they do, we need a new generation to grow”. 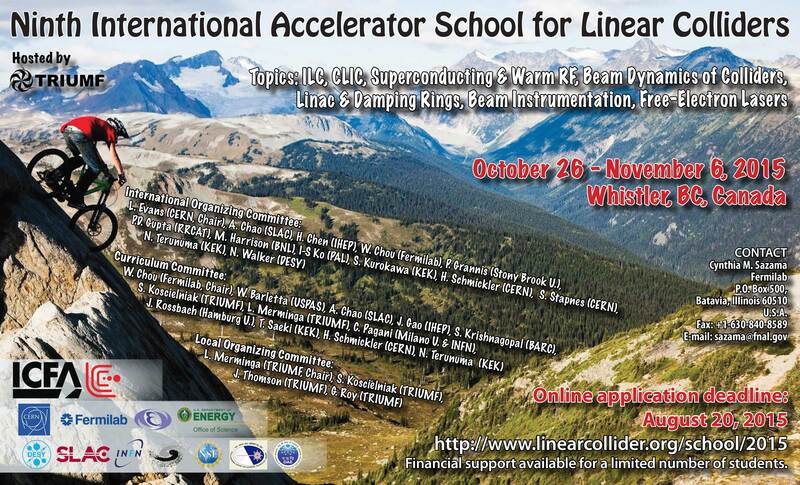 The topics for the school were TeV-scale linear colliders including the ILC, CLIC and other advanced accelerators. An important change of this year’s school from previous ones was that it also included the topic free-electron lasers (FEL) because the FEL is a natural extension for applications of the ILC/CLIC technology. There was one more difference for this school from the previous ones. Because a Linear Collider Workshop was held in the same place at the same time, there was a joint plenary where the students could participate in the conference. The session entitled “LC Future directions” lasted one whole afternoon. The first half of the session was about the status of the linear collider study, and the other about future technologies such as laser plasma or plasma wakefield acceleration, and its possible application for the linear colliders. “A joint plenary with student was a good opportunity to drive students’ interests by presenting the future possibilities and associated issues,” said Kuriki. Students were given homework assignments and a final examination, and students with excellent results were given a “Student Award,” in the banquet held the last day. This is the list of awarded students*: Jim Ogren, Uppsala University, Sweden, Fernando Maldonado Millan, University of Victoria, Canada, Weiwei Tan, Peking University, China, Yasuhiro Fuwa, Kyoto University, Japan, Jorge Giner Navarro, Instituto mixto del Consejo Superior de Investigaciones Científicas (CSIC) University of València, Michele Bertuccia, INFN, Italy, Robin Rajamaki, CERN/Aalto University, Finland, Douglas Story, TRIUMF/University of Victoria, Canada, Dario Pellegrini, CERN/École Polytechnique Federale de Lausanne, Switzerland, Liu Yang, TRIUMF, Canada, Lianmin Zheng, Tsinghua University, China, and Juergen Pfingstner, University of Oslo, Norway. “Students form the early schools have already become leaders or are playing leading roles in this field, so I am so happy to see so many young people who decided on and want work on this project. I really hope that Japanese government will give a green sign for these excellent future scientists,” said Chou.